So much of our universe has been or continues to be beyond our ability to easily study or comprehend. 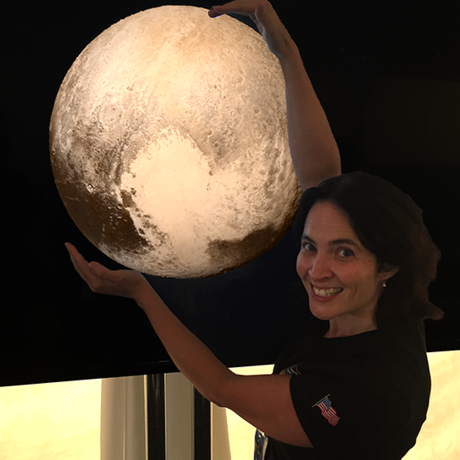 As a senior research scientist on the New Horizons team, Dr. Carly Howett studies the planet beyond all others in our solar system: Pluto. The images returned by the New Horizons satellite revolutionized our understanding of the Pluto system, transforming it from a demoted planet into an enticing ice world. This talk will focus on how she and her colleagues creatively solved the problem of studying a planet nearly beyond our solar system and brought it back from beyond our understanding. Dr. Carly Howett is a Senior Research Scientist at the Southwest Research Institute in Boulder Colorado. She obtained her Ph.D. at the University of Oxford in 2005, and has been working on New Horizons since 2012. Since then her main interest has been the calibration and image processing of data from New Horizon’s Ralph instrument – the color “eyes” of the spacecraft. She is also on NASA’s Cassini mission, which has been investigating the Saturn-system since 2004. Outside of work she enjoys all the forms of running, jumping and outdoor-stupidity Colorado has to offer, particularly cycling, skiing, swimming and climbing.